Microsoft Rejects Xbox One Backwards Compatibility Report, Calls Findings "Grossly Inaccurate"
"Quality games last and are worth playing." Ars Technica issued a correction today to their widely reported survey last week which suggested that time spent on backwards compatible games on the Xbox One were far less than expected. Members of the Xbox team spent the week Tweeting their skepticism of the Ars Technica report (since corrected), and today issued an official rebuttal. Ars Technica used the Xbox API to gauge a random sample of almost a million Xbox Gamertags over the course of five months to gauge how players spend their time on the Xbox One. Based on their readings, Ars Technica concluded that only 1.5 percent of the the time gamers spend playing the Xbox One was spent on backwards compatible games. "That fault in the underlying data has led us to vastly underestimate total usage times for the apps and games in our usage sample. Graphs and charts that refer to average minutes played or percentage of users who played a game during that 4.5 month period seem to be an order of magnitude lower than the actual per-app usage rates and times. 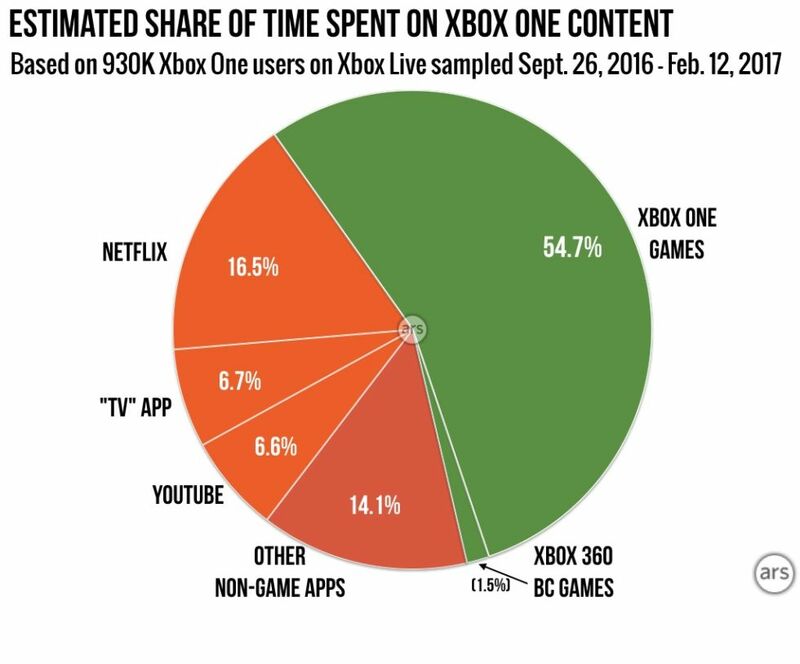 The "My Games and Apps" section of the Xbox One was used by 71 percent of Xbox One players during our sample, according to Microsoft, not the approximately 6.3 percent shown by our data." "We've carefully reviewed Ars Technica's article, and have completed our own analysis of the actual data using identical parameters," said Microsoft in a statement to VG24/7. "As an example, we specifically know, based on our complete view of Xbox Live usage data, players are highly engaged with backwards compatible game titles. It's why we continue to support this well-loved feature and the games that use it." However, Ars Technica responded by saying that the approximate usage recorded by the API has an unclear effect on the relative usage reported in their rankings. If the API undercounted at the same rates across all Xbox One services, then the relative rankings should still be valid across the random sample. In the meantime, backwards compatibility is expected to be touched on in Microsoft's E3 presentation today. Xbox head Phil Spencer tweeted in regards to backwards compatibility that "Usage remains high. Quality games last and are worth playing." Check in on our coverage of today's Microsoft E3 press conference in our media hub here. Tagged with Backwards Compatible,	Microsoft,	News,	Xbox One.